We have a few updates to our Patreon special this week. The final 6 pages of Chapter 4 are now available to anyone who has made a pledge of 1$ or above. You can find them here. At the end of the week we will be posting the first six pages of Chapter 5 for anyone who has donated 5$ or above. Have a wonderful week guys! Thank you for your support as always. So how many more times is Accel going to come within an inch of death? If this was a white wolf RPG, quite a few times easily. But in real life, you would be amazed at the sheer levels of “Ho-lee She-yit!” the body can take and just flat out refuse to die. I’ve seen patients with bodies you could confuse as the blobs of mystery meat they shove into the grindomatic 2300 at the dog food factory. Live with minimal scarring and no obvious neural injuries. Rather like the line from the second Aladdin film by Disney: “You’d be amazed at what you can live through.” If my recently arrived pastor had not been one of those people you describe, though, I’m not quite sure I’d believe you (leastways not easily). I just have never met such before I met him, that’s all. Oh trust me, no one believes my stories if they don’t work in the medical field. Classic example, dumb stunt on a motor bike that involved a punk old enough to know better being tossed off. By the end, both arms broken in multiple bones and points, a miracle he didn’t break his neck, some fractured points in his spine, and he ended up hitting the corner of an old fence post, impaling about three inches of splintered wood just a bit south of one kidney missing his ureter and renal arteries/veins by a miracle. Somehow his legs were spared, figure his head and upper limbs took most of the force. Three surgeries to repair all the damage, not including a few extra ones as an outpatient to try and help with scaring and post op complications. Final verdict? Kid looked fine when it was all over nearly a year later. Only weird thing was a twitch in one eye when he heard any sounds like a motorbike. Then you get the weirdos who trip, stub a toe, and end up with something that should be impossible outside of comic books, like airborne and contagious porcine ear cancer. Anyway, now that you actually tell the story, it’s totally believable to me. It rings true. The real truth – stated by Carl Jung himself! – is that people can’t be introverted or extraverted, only cognitive processes can be. You do have a preferred order of cognitive processes and it can be spotted, once your adaptations of the moment and over your life are accounted for; a lot of theory and practice has been done which shows how much “straws in the wind” the MBTI assessment is anyway. There are much better, multi-disciplinary ways of finding out, eminently worth the time. The MBTI – for 30 years, Coldesta, off and on! – mistyped me as an INTJ. It took very careful cross-model comparison: temperament, social style, cognition, dichotomy (like the MBTI), and most revealing to me personally, archetypes – to affirm to my satisfaction that I was in fact ENFP in preference (in temperament, NF but with a very strong NT backup, thus the fooling of the MBTI for so long). What kept *me* self-deceived was that I didn’t understand how an imposed or self-imposed social style kept me from seeing how I most naturally and most frequently reacted in social situations. Once Vicky Jo Varner my coach got me to see that, the rest followed. Embracing what the implications really meant took longer. Your brand, or anyone’s brand, of “dark humor” is diagnostic – one can narrow down the core type to two possibilities by that alone (it’s based in the 7th-level process, sometimes called the Trickster or Mischievous Child). Design ideas gone awry? And you laugh at them? That sounds like Trickster Te, and that narrows the choices down to INFJ and ISFJ. An INFJ punctures the walls of an ENFP as no one else does and vice versa. The same is true for ESFP and ISFJ. I suggest ISFJ, especially since such people have an overall pattern of being nurturing anyway. Now don’t take this as argument from authority simply because I “tell” you. Cross-check until you KNOW how everything fits together. Took a while to reply, mostly because I was reading all of that. Wow. I think taking it in I’m going to try it out again with most of that in my head. A few comments, but thanks! Overall, the dark humor is laughing at things not working, but also being able to appreciate the humor of pitch black, morbid beyond belief things. Like watching Reanimator and laughing when the visual pun happens near the end that probably half the viewers didn’t get. If your mind works like mine, you’ll know it instantly. I bounce between extraverted and introverted sensing. Over all to respond, I agree more with INTJ, mostly because of a few descriptions that sent chills down my spine. Yeah, I’ve learned how to create the extrovert personality online, and how to socialize like a normal person, in some ways. Other ways I got to just watch and try to mimic until it clicks in my head and I find the patterns to repeat. Hard part was learning how to put inflection on my voice when needed. The nurturing thing is kind of weird and I can’t explain, mostly cause I explained a lot of it better over on XTIN about how I came to where I am. I saw a need, and I chose to fill it. It’s a long and strange journey. Makes perfect sense to me however. I know a few ISFJs and you don’t seem to fit that mold in many ways you talk about. But INFJ? INTJ and INFJ are two of the pairs that get confused and given your focus on the abstract you’re one of the Ns not Ss. But while INFJs like ENFPs love to use logic that is not their actual strength in decision-making. IN… What is your *primary preoccupation? Foresight? Do you support that with concern for group harmony (this is the faculty with which INFJs and ISFJs deal with the world: Fe)? Those two with the Trickster Te would confirm your core type as INFJ. On the other hand (last note here), much of what you say fits the INTJ pattern even better than the INFJ pattern – but we should take this elsewhere. For one thing, we have to get you disillusioned about what “normality” is. What is normal in these psychological terms is what functions properly according to intended design. An INTJ especially, if you are one, should appreciate that. :) For another, we can approach details about how *everyone alternates between the pairs of Sensing (or any of the other pairings – that is part of the design of the psyche), the definitions of “extravert” and “introvert”, and so on. Much of your apparent confusion on this topic stems from confusion over definitions and functional hierarchies, as with most people I encounter who have to unlearn (as I did) bad practices imposed on them by those working with the MBTI in ways in which it wasn’t meant to be used. Kaden attacks Aedile #1: 15+3+1=19 vs AC16. Hit. Aedlie #1 takes 6 damage. Aedile #1 attacks Kaden: 9+5=14 vs AC15. Miss. Aedile #2 attacks Lenna: 13+5=18 vs AC18. Miss. Lenna attacks Aedile #2: 19+5+1=25 vs AC16. Critical. Aedile #2 takes 14 damage. Actually, Aedile #2 attacks Lenna. Lenna is in parry mode, DC 20 vs 20+20, Critical success. Lenna Counters. 20+1+5=25 vs AC 16, critical hit, Aedile #2 takes 14 damage, begins bleeding. Couple that with the fact that he doesn’t use his double-sword weapon to its best advantage, I think you have an excellent point. Might it just might be that she’s unfairly and inhumanly fast about countering before he could react? Accel zombie and his necromancer. Given his orientation, his priority appears to be finishing Accel off before these rescuers can get to him. With the coldness in his expression, it might even matter to him more than surviving. Perhaps… It just seems like a common occurance where the evil cleric, dark sorcerer, or mad scientist insists on ignoring the heroes and focusing on his ritual, incantation, summoning, or experiment while the heroes thump on his minions. Only *this* evil cleric didn’t have enough minions to keep all three heroes distracted. This guy is like the local version of New Khan and the Witch King of Sauron’s Host combined: first and best guess, INTP of grindingly bad character and perhaps deep, dark magical power to go with it. So yeah, type-casting (no pun intended) this may be, but it fits. What I’m wondering is how Accel is even alive, let alone coughing, and that despite other comments above. Somehow I don’t think Tall, Dark and Unfeeling up there is reviving him either, despite my earlier jibe about zombies. I think he’s about to finish Accel off, and as impersonally as possible. Worry about finishing spell successfully? 1. Worry about finishing spell quickly? 2. Worry about support from minions meanwhile? 3. Worry about anyone personally? 4. Well, there’s also the fact that in most cases, fumbling the spell/ritual/experiment can (and usually does) have consequences far worse than anything the heroes can or intend to do. Failing the ritual/experiment, etc. may instead of bringing a demon/devil/unstoppable weapon under the control of the Big Bad, simply unleashes a nigh-unstoppable force beyond comprehension on the world. Or the devil/demon that’s expecting sacrifice instead turns on the summoner, and that’s a whole new Fate Worse Than Death. 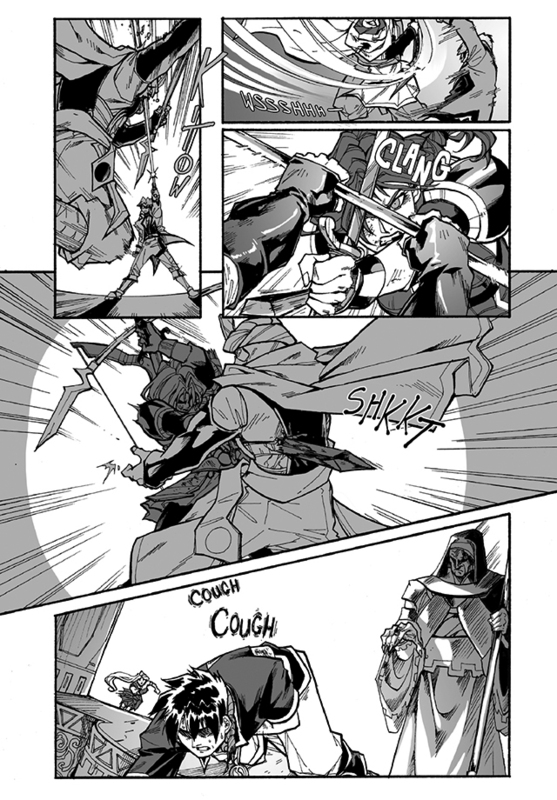 I’m surprised Accel can even manage to cough after being impaled on a sword.